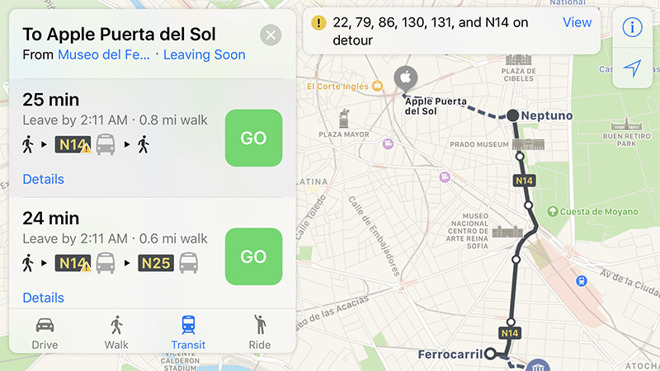 As seen in the screenshot above, iOS and macOS device owners living in Madrid can plan trips using data from the Empresa Municipal de Transportes de Madrid bus service, Madrid Metro and Cercanas Madrid. Train station information and partial maps are also available, with some locations showing additional data like support for Apple Pay. The app is also showing travel advisories for certain services like bus detours due to road work. Apple is pulling data for each transit service from first-party sources. For example, EMT Madrid is providing timetables for the Empresa Municipal de Transportes de Madrid bus line, while Cercanas information is provided by railway operator Renfe Operadora. At the time of this writing, Apple appears to be in the process of rolling out coverage, as Maps on macOS is for some users returning an error message saying, "Transit information for Madrid is not available." AppleInsider testing has confirmed that Transit directions and station data is working on iOS. Apple initially offered transit directions as part of Maps through a partnership with Google, but the feature was removed with iOS 6 in 2012. With the buildout of Apple's own mapping service, Transit data returned in iOS 9 powered by technology acquired through purchases like HopStop and Embark. The rebuilt Transit feature provides routes, departure times and other relevant data for buses, trains, ferries and other forms of public transportation. In addition to local schedules, users can access top-down views of select underground subway and train stations. The service launched with minimal support in the U.S. and China, though updates last year added expanded international support in the U.K., Germany and the Czech Republic. Earlier this year, Apple flipped the switch on Transit in Paris and Singapore. Most recently, Transit arrived in the Netherlands and Adelaide, Australia last month.